At first I thought it was a crazy art exhibit which got horribly out of control. As though the artist kept laying down more pieces, and just kept going because nobody told him to stop. It reminded me of the Anthony Gormley exhibit I saw back when he had the exhibition at the Hayward Gallery, and filled a room with person sized blocks which you could walk between and around. 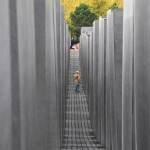 Just south of the Brandenburg gate is the Field of Stelae, an almost 20,000m² field of 2,711 concrete blocks each with a pathway in between to find your own way through the memorial. Thousands of concrete blocks might seem like something out of a 60s nightmare, but the effect is stunning. Walking from one side to another is a feat the will very likely find you meeting suited businessmen carrying coffee, tourists (such as myself) hunting for a clear stretch to take photos, young children tumbling and giggling as they twist and turn around aimless unknown corners, teenagers racing down the 1 metre wide passageways oblivious to pushchair dangers lurking behind the block, parents shouting names of lost young children still tumbling and giggling, and the best location in the whole world for a game marco polo. The whole piece was designed by Peter Eisenman and you might be quick to suggest meaning behind the concrete blocks, the pathways and the shadows cast. The information leaflet I picked up is quick to disperse those ideas, and claims the memorial is unique in that it uses no symbolism. One of the FAQs at the back: “Why are there 2,711 stelae” is answered quite frankly that it is the result of “measurements chosen by the architect for the location”. Well, duh. It goes on to say that it bears no relation to the number of victims, or hold any symbolic significance. It is, just because it is. This is one of the most refreshing displays of both remembrance, and art that I’ve ever seen, and I love it.